Water Street Home Your Headphones May Be Water-Resistant, But Your Music Most Certainly Is Not! 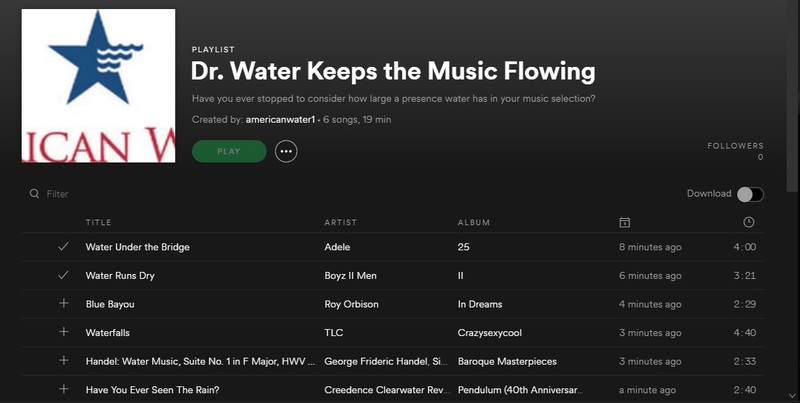 Have you ever stopped to consider how large a presence water has in your music selection? Whether it’s directly in the title (Adele’s “Water Under the Bridge), alluded to in the title (Peter Gabriel’s “I Go Swimming”), in the lyrics (The Who’s “I need a drink of cool, cool, rain”), or an overall theme (Roy Orbison’s “Blue Bayou”)… you may be surprised to discover just how often water seeps into your play list, workout sound track, favorite road trip tunes and more! From today’s pop, hip-hop and country songs, and traveling all the way back to the 18th century and Handel’s Water Music, water has played a significant role in society’s musical pleasures. In fact, I bet you could rattle off at least 5 water-song examples with barely giving it any thought. And, after you read this blog, I’ll ask you to check out the water playlist we’ve already started here on Spotify. Water is the other universal language! Just as music transcends language barriers to unite everyone, water knows no boundaries of culture, age, faith, etc. There is a global understanding of water and appreciation for it as a life necessity. Water is musical. As you listen to the songs, go past the lyrics to identify water sounds (a roaring ocean or gentle rainfall) as one of the instruments in the band. Water is refreshing, energizing, and empowering. Its presence makes music more attractive and perfect for music the helps us through inspiring workouts or uplifting someone feeling blue. Water is cathartic. Also making it more attractive and popular. Water has almost infinite symbolism! Want your music to convey hope, life, rebirth, strength, purity, innocence, transformation, growth… water can get any of these messages—and many others—across. We frequently discuss the importance of water on top-level topics such as being critical for a strong economy, business and life in general. But, far from being frivolous, looking at the abundance of water in our musical selections just underlines the significant impact it has on society—and has had through the ages. Water in music is not trendy, but it’s had a permanent presence because it simply is part of who we are as individuals and communities. Now, take a listen to that water playlist we started on Spotify and give us your suggestions of songs you’d like us to add.